Water pressure is regulated by a bell shaped device called a pressure regulator. A pressure regulator was designed to keep a house plumbing system safe when the city increases their water pressure for cleaning and other matters. This device is located at the front of your home at the main water service (also found in garages). It is designed to only allow 45 to 65 pounds of water pressure (psi) into a home. Over-time a water pressure regulator can fail. You can test this by purchasing a pressure gauge from your local hardware store. This is twisted onto the front water spigot (hose-bib), then turn on the water. The dial on the gauge will move to the number (see picture on the left). 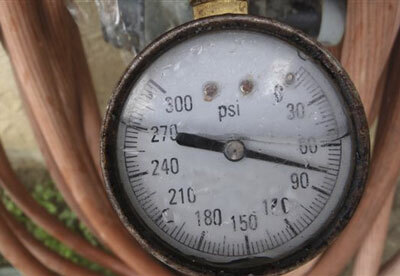 If your water psi is over 65psi, your water pressure regulator has failed. It is very important to have a water pressure regulator installed to your home, if there is not one already. Protect your home from unexpected water leaks by checking the water pressure and having a pressure regulator installed by a licensed plumbing contractor.